The USS SHASTA (AE-33), a Kilauea-class ammunition ship, was commissioned on 4 FEB 1972. USS SHASTA served her country for 25 years, 7 months and 27 days, until decommissioned on 1 OCT 1997. USS SHASTA was built in Pascagoula, Mississippi. After commissioning and then shake down training at at Guantanamo Bay, Cuba, SHASTA transited the Panama Canal in June 1972 and took up station at her homeport at NavWeapSta Concord CA. Almost immediately, SHASTA began a series of Western Pacific deployments that continued throughout her career. The Iranian Hostage Crisis and the following growth of the US Navy presence in the Persian Gulf, extended a number of SHASTA's deployments in to the Indian Ocean. SHASTA was in theater for Desert Shield - Desert Storm in 1990-1. 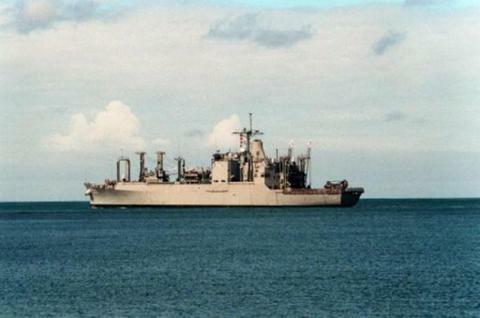 USS SHASTA was decommissioned in OCT 1997 and transferred to the Military Sealift Command. She continues supporting the Fleet as T-AE-33 crewed by civilians under Navy leadership. The second Shasta's keel was laid on 10 November 1969 by the Ingalls Ship Building Division, Litton Systems, Inc., of Pascagoula, Miss. Sponsored by Mrs. Ralph W. Cousins, wife of the Vice Chief of Naval Operations, she was launched at Pasagoula on 3 April 1971. The Navy took possession of Shasta on 4 February 1972 at Charleston, S.C., where she was commissioned on 26 February, Capt. Warren C. Graham, Jr., in command. Shasta departed Charleston on 22 May 1972 for shakedown training in Guantanamo Bay, Cuba. After completing the training and making a brief visit to Kingston, Jamaica, she steamed out of Guantanamo Bay on 10 June 1972, bound for her home port, Concord, Calif. Along the way, Shasta called at Cartagena, Colombia; Panama City, Canal Zone; and Acapulco, Mexico. She arrived at Concord on 3 July. Shasta then underwent ship's qualification trials, final contract trials, and other preparations for her deployment to the western Pacific which began on 3 January 1973. As of 17 September 1974, Shasta was operating in Far Eastern waters.